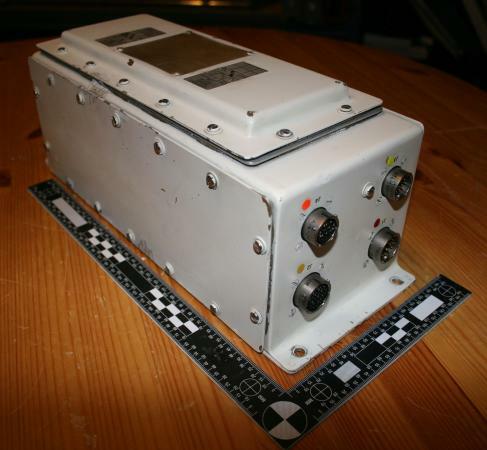 An Apollo Command Service Module (CSM) Service Module Jettison Controller (SMJC), produced by North American Aviation's Autonetics Division installed as part of the spacecraft's Sequential Events Control System (SECS). The SMJC was responsible for commanding activities associated with detachment of the Apollo Command Module from the Service Module just prior to the CM's reentry into the Earth's atmosphere. Two (redundant) SMJC assemblies were installed in the forward bulkhead of the Service Module and supported by battery power so that they could autonomously perform their function after Command/Service Module separation. Physical separation required severing of all the connections between the modules, transfer of electrical control, and firing of the Service Module Reaction Control System to increase the distance between the CM and SM.